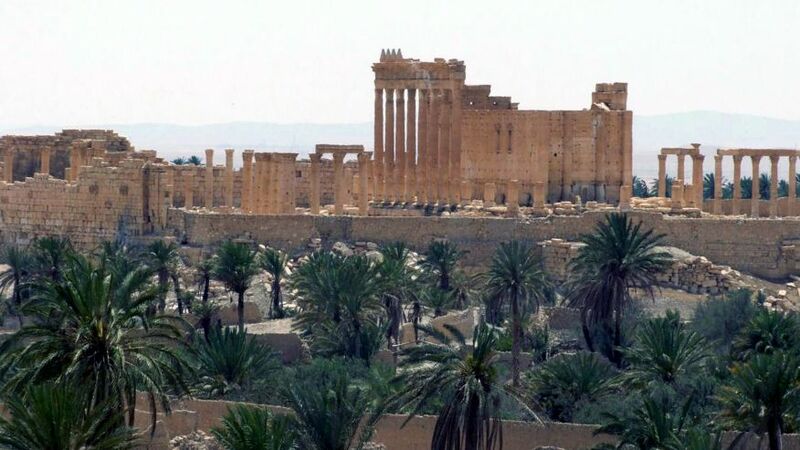 Syrian officials were scrambling Wednesday to keep antiquities from the ancient city of Palmyra from falling into the hands of ISIS, as the terror group stormed a nearby area in the Syrian desert. The country’s antiquities chief told Reuters that hundreds of statues have been moved from Palmyra in central Syria to safe locations after ISIS infiltrated the city Wednesday. "Hundreds and hundreds of statues we were worried would be smashed and sold are all now in safe places," Maamoun Abdulkarim told Reuters, but voiced his concern about Palmyra’s museum and large monuments that cannot be moved. "This is the entire world's battle,” he added. Syrian activists said that ISIS extremists seized almost full control of the ancient town of Palmyra Wednesday, though it was unclear how close to the famed archaeological site they have come. The ruins are just southwest of the town. Palmyra, located about 150 miles northeast of Damascus, dates back to the second millennium B.C. A UNESCO World Heritage site, the city was one of the most important cultural centers of the ancient world and has been home to Arabic, Aramaic, and Greco-Roman culture. Palmyra contains numerous monumental ruins, including the Temple of Ba'al, an ancient theater, and its famous colonnade. Michael Raggi, a business intelligence analyst and art fraud expert, told FoxNews.com that the Syrian government is likely protecting Palmyra’s trove of funerary sculptures. "The removed statuary is likely comprised heavily of the Roman-influenced Semitic and Seleucid funerary portraits which were used as ancient headstones after the Romans took control of Palmyra and the Seleucid kingdom in 64 B.C.,” he said in an email. “In this removal effort we see an army of the living protecting the dead and the memory of their lives." "Given ISIS' past actions, moving the statues is a vital precaution," added Christopher Jones, a graduate student in ancient Near Eastern history at Columbia University and author of the Gates of Nineveh blog. "The ruins themselves are still under threat though even if there are no statues." ISIS has launched a series of wanton attacks on sites of historic and religious importance. Earlier this year, for example, ISIS released a video that showed militants using sledgehammers and drills to destroy artifacts in Iraq’s Mosul Museum. Experts also have warned that militants smuggled priceless Iraqi artifacts out of the country for sale on the black market to fund the terrorist army.